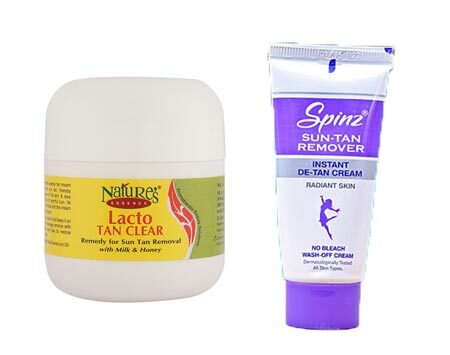 Home » Best Of The Best » Best Sun Tan Removal Products in India: Our Top 10! Best Sun Tan Removal Products in India: Our Top 10! With the onset of peak summers, we are sure the biggest concern of everyone would be tanning and sun burns. 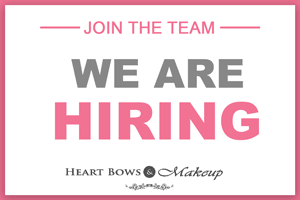 While we love to go out in the sun, shop, eat, go on vacations, visit the the beach etc but when we return home with tanned, dark and dull skin, we wish we had never gone out in the first place.Well you must always apply a good sunscreen lotion on the body but for the days it is almost impossible, Team HBM has you covered. 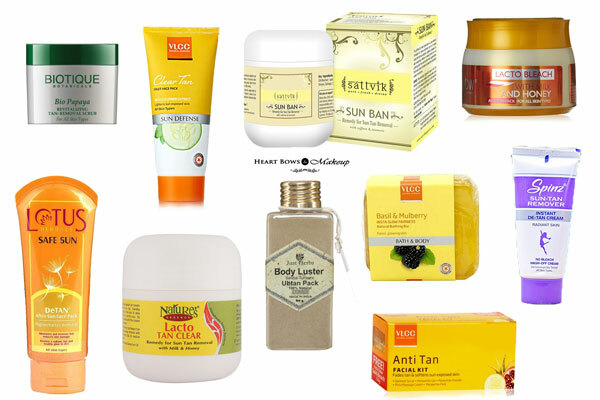 Here is a round up of the best sun tan removal products in India from face scrubs to face packs and de tanning creams. And like always, they are affordable and effective. 10 Best Sun Tan Removal Products in India: Face Creams, De Tanning Packs & Scrubs! If your face is badly tanned, then a facial is a good option. VLCC makes some of the best home facial kits in India and their Anti Tan Facial Kit is really effective at lightening the tan and making the skin look brighter. The kit comes with a cleanser, scrub, face gel, facial cream, face pack and moisturiser. It smells pleasant and shows great results. It is definitely the best tan removal facial kit in India. 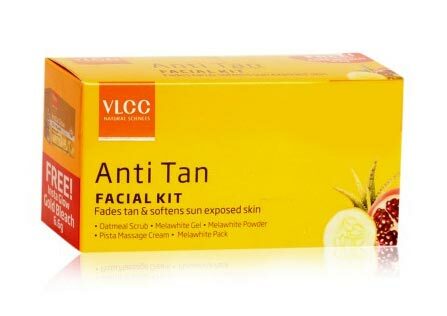 This tan removing pack by VLCC is a popular face mask for summers. It contains natural fruit extracts of cucumber, pineapple and mulberry in an ayurvedic formulation. Being a creamy face pack, it also softens and nourishes skin apart from lightening the tan. 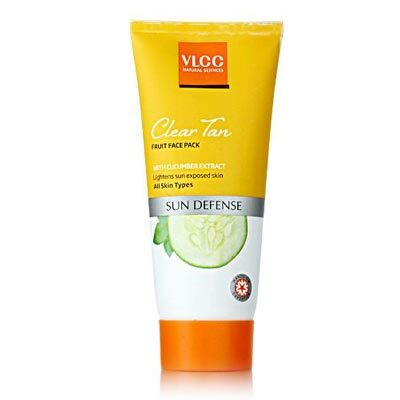 The VLCC Clea Tan Fruit Pack is suitable for use by all skin types. One of the best sun tan removal products available in the Indian market. This is a big hit amongst teenagers and college girls for the very affordable price, natural and safe ingredients along with its effectiveness. It is enriched with milk proteins and honey which helps to remove epidermal sun tan and also restores the natural fairness of skin. You can also notice a visible glow on your face. This is the best and affordable tan removing cream in India. If you’re looking for an effective sun tan removal cream then this is no-bleach, wash off cream by Spinz is a great option. All you need is just 5 minutes for it to work its magic. The Spinz De-Tan Cream removes even stubborn tan effectively in the first wash itself and gives radiant, fair skin. It can also be used on hands and feet and does not contain any harmful bleach or chemicals. 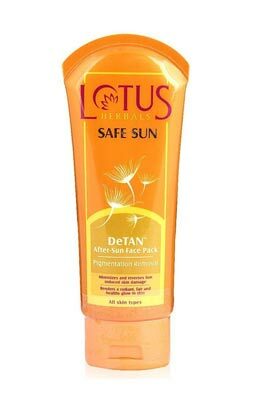 Lotus Herbals is the best brand in India offering a wide variety of anti-tan products. If you are suffering from tanned skin, get this face pack immediately. It contains liquorice extract, dandelion and carrot extract which helps in removing skin tan and sun damage. You can notice visible difference in first use itself. A great anti tan mask that we highly recommend. 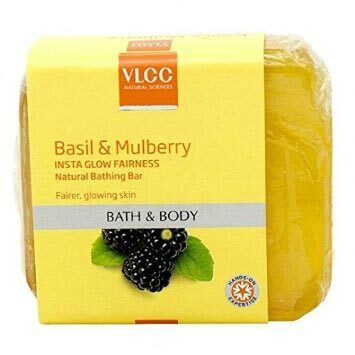 If you’re looking for a tan removal soap then this fairness soap by VLCC is a great option. It not only cleanses the skin adequately but also helps in considerably lightening the tan over a period of time. It smells quite lovely and contains skin lightening ingredients like basil, mulberry & almonds. If you’re into handmade soaps then Burst Of Happyness Red Clay Soap can also be a great option for sun tan removal. 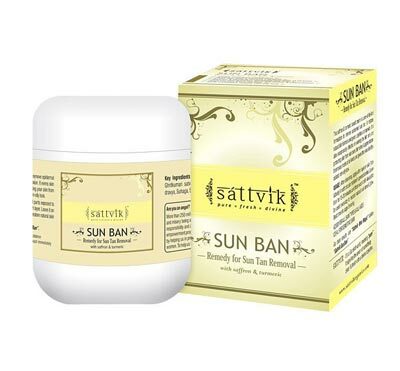 This 100% organic and vegetarian product by Sattvik Organics is a great tan removal cream. It contains key ingredients like saffron and turmeric which enhances the complexion, removes discoloration and evens out skin tone. Also protects from sun burns, blemishes and pigmentation. However, one must use it regularly for it to show results. This effective de-tanning face scrub exfoliates the skin well, unclogs pores and removes dead cells. It brightens up the face and with regular usage also removes sun tan. The affordable face scrub is suitable for all skintypes but might be a bit harsh for those with sensitive skin. 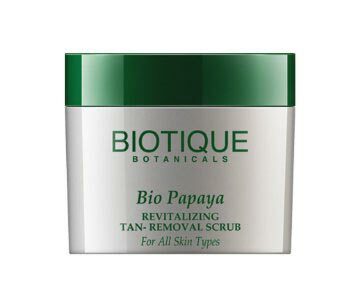 Can also be used as an anti tan body scrub and helps with ingrown hair follicles. 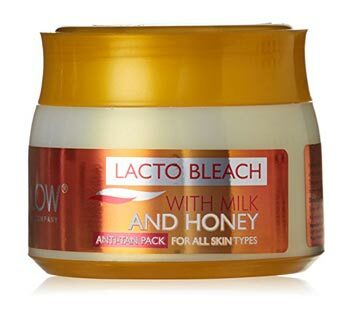 The main ingredients in the cream are milk and honey which are effective anti tanning agents. This is an anti tan pack even though from the name you might think it is a bleach or a face cream. Its good at removing sun tan and is surely worth giving a try. If you are suffering from tanned arms and legs, then this is the right pick for you. 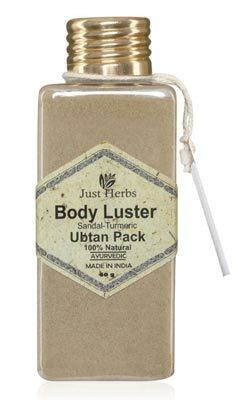 Skip the soap and use this anti tan ubtan by Just Herbs which is a great exfoliating and polishing treatment. Regular use prevents skin darkening and reduces unwanted facial/body hair. It is 100% natural and contains certified organic neem, turmeric, chickpea, orange peel, lentils, indian volcanic clay etc.There are no added color, fragrance or preservatives. So those were the most effective and affordable sun tan removal products available in India. Let us know if you’ve used any of these products and your experience with them.